The Sugar Free Chocolate Rose is an option just like our regular Chocolate Rose Suckers. The Sucker sticks are wrapped green with simulated Leaves. They are prefect for your sweetheart, Gift baskets, or presents for staff. These are just like giving regular flowers but edible. Multi-able colors are available. Our white, milk, and dark sugar free chocolate is a delicious, smooth and creamy. 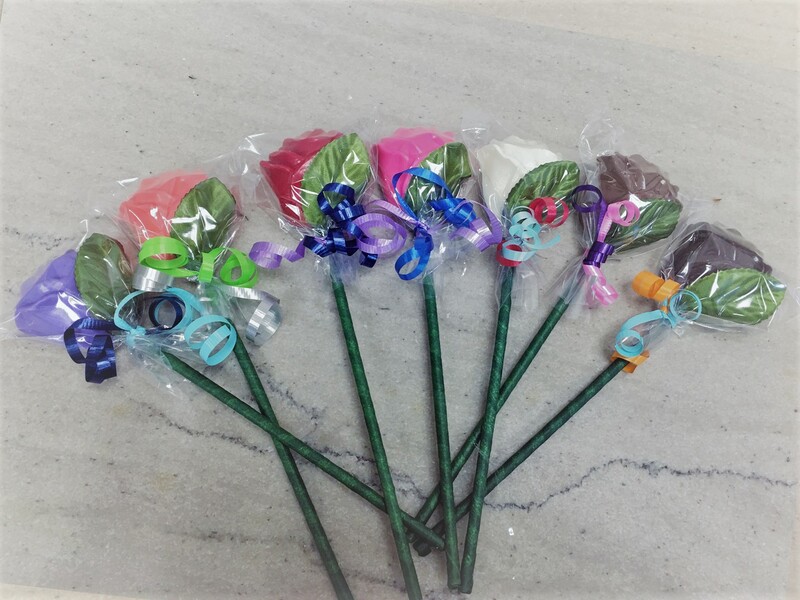 Colored roses are white sugar free chocolate based. Normally every rose is individually wrapped and window boxed. Variations in individual size, shape, color, and weight are normal. Chocolate may melt in shipping if ordering during warmer temperatures. Shipping options with an ice pack during summer months is encouraged. Do not over heat, keep moisture out of candy. Ingredients-subject to change with out notice:White Chocolate(sweetened with Maltitol (does not promote tooth decay, and has a lesser effect on blood glucose, Cocco butter, Nonfat Dry Milk, Milk, Soy Lecithin, and Vanilla. )Milk Chocolate (Maltitol, Partially Hydrogenated Palm Kernel and Cottonseed Oils, Nonfat Dry Milk, Milk, Glyceryl Lacto Esters of Fatty Acids, Soy Lecithin, Salt, and Artificial Flavor.) Dark Chocolate(Maltitol, Partially Hydrogenated Palm Kernel and Cottonseed Oils, Nonfat Dry Milk, Cocoa Processed with Alkali, Cocoa, Glyceryl Lacto Esters of Fatty Acids, Soy Lecithin, and Salt.) ALLERGENS: CONTAINS: MILK, SOY.